SharePoint Lists Views SharePoint lists are the primary building blocks when setting up a SharePoint site. Pretty much any system is designed to takes and give information and SharePoint relies on lists to make that happen. So list are important, it stores the information you want to share, it sources workflows and forms and it defines how things relate to each other. We rely on List Views to interact with these lists which is great, but these views are created by SharePoint and gives us limited control in how we can configure the interface, which is a shame because sometimes the lists are just too important to rely of the basic configurations. I was faced with an interesting challenge, I was tasked to provide a list of all the sites available via our O365 subscription, but I was not given sufficient access rights to navigate to the administration portal to pull this list. Selecting, copying and pasting the content into Excel seems like the obvious next step, but alas, I was faced with one column of data with all the information that appeared in my view, i.e. the site title, the news title, the news synopsis the author and the modified date. All I want was the site title. After cleaning up the Excel a bit, I noticed that the information that I wanted appeared in every 4th row. Meaning that if I could somehow transpose this single column of data into a grid with 4 columns, I will easily get the information I want. Unfortunately, this type of transpose function does not exist in Excel. 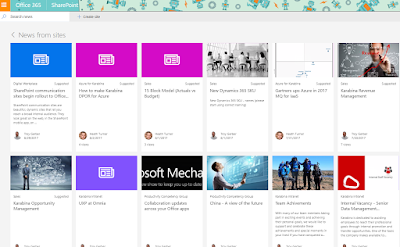 Before Office 365 (O365), when we were asked to build an intranet, we built a SharePoint solution with an inviting home page and some sub sites that promotes team collaboration. Maybe we added in a few interactive features and "Ta-daaa", your intranet was done. Now, its the game is different, and many of the players don't even realise this. An intranet that is using Office 365 is more than just a pre-defined set of pages that has a starting point and set navigation plan that should be used by all. Its use is now dictated by the users, and if done right, no 2 users will experience their Intranet in the same way.